This blog is meant to be both a travelogue and an introduction to what it means to be a "Teardrop Camper". The site is also a place where we will be testing out content for the book we are (very slowly) writing about our camper, equipment and experiences. "Teardrop Camper"? Huh? What is that? A Teardrop Camper is someone who has embraced the camping lifestyle that comes along with owning or using a Teardrop Trailer. It&apos;s a more refined (and comfortable) method of camping than tent camping, and more outdoorsy than traveling with a large trailer or motorhome. Many people are finding that this is a "just right" method for camping and it is becoming increasingly popular. What is a "Teardrop Trailer"? Teardrop Trailers are small travel trailers with a shape that is like a teardrop. They were originally developed in the 1930s and many plans exist for how to construct them yourself. These days you can also find many commercially available versions of them that are newly constructed. They are often lightweight (800-1500 lbs.) and can be pulled behind smaller cars or motorcycles. Many are designed very minimally with a bed inside the main cabin with a few cabinets and a kitchen that pops open in the back hatch. There are different sizes and styles available to be more or less elaborate. Teardrops are typically comfortable for 2 people and maybe a dog or a child. They are among the smallest travel trailers available and are easier to setup and use than popup trailers. I liken it to being a studio apartment on wheels rather than a house on wheels. It&apos;s just big enough without being too much. 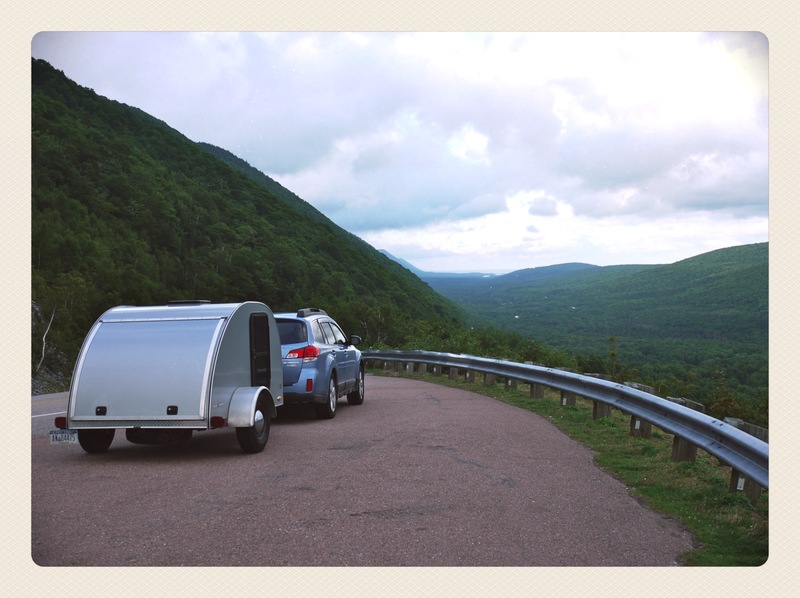 In the spring of 2010, in the midst of a small mid-life crisis, my husband and I decided to buy a Teardrop Trailer and take it on a trip to Acadia National Park in Maine and then around Nova Scotia for a sabbatical I was taking from my job. We had camped for many years, but as tent campers we had never been able to stomach the thought of a trip that was more than a week or one where we moved from place to place often. The Teardrop was an opportunity to make it easier for us to camp, easier to stay dry and a way to be more mobile. Our nearly 3 week trip that summer was an amazing adventure with 11 different stops and campgrounds along the way. And it wasn&apos;t just the trip or the break from work that was life changing- it was the Teardrop. Owning this little trailer has changed the way we camp and vacation and think about travel. We may at some point in the future outgrow the tiny camper and opt for something a bit bigger, but we don&apos;t see a day where we outgrow the desire to connect to nature and be active in the way the teardrop lifestyle enables! Love your blog! As longtime campers/brand new teardroppers, we find your tips very helpful. We are packing our newly-acquired Little Guy Rough Rider for our first trip. We are traveling from Indiana to the Utah desert in April. Our first daunting task is setting up our galley (which lacks the nice storage features you have.) How do we pack our camp cooking gear in our teardrop galley?